The periodic table is a chart that shows the chemical elements and their relationship to each other. The periodic table is a graphic way of representing the periodic law. By the middle of the nineteenth century, about 50 chemical elements were known. One of the questions chemists were asking about those elements was the following: Is every element entirely different from every other element? Or are some elements related to other elements in some way? Are there patterns among the elements? Most of these classification schemes were not very successful. Then, in about 1869, two chemists made almost the same discovery at almost the same time. Russian chemist Dmitry Mendeleev (1834–1907) and German chemist Julius Lothar Meyer (1830–1895) suggested arranging the elements according to their atomic weights. In doing so, Mendeleev and Meyer pointed out, the properties of the elements appear to recur in a regular pattern. Atomic number: The number of protons in the nucleus of an atom; the number that appears over the element symbol in the periodic table. Atomic weight: The average weight of all isotopes of a given element, expressed in units known as atomic mass units (amu). Element: A pure substance that cannot be changed chemically into a simpler substance. Isotopes: Two or more forms of the same element with the same number of protons but different numbers of neutrons in the atomic nucleus. Nucleus: The small core at the center of an atom that contains protons and (usually) neutrons. Today, Mendeleev is usually given credit for discovering the periodic law because he took one step that Meyer did not. When all the elements are laid out in a table, some gaps appear. The reason for those gaps, Mendeleev said, was that other elements belonged there. But those elements had not yet been discovered. Mendeleev went even further. He predicted the properties of those yet-to-be-discovered elements. He knew where they belonged in the periodic table, so he knew what elements they would be like. Remarkably, three of the elements Mendeleev predicted were discovered less than a decade after the periodic law was announced. The periodic table used today is shown in Figure 1. It contains all of the known elements from the lightest (hydrogen: H) to the heaviest (meitnerium: Mt). Currently, there are 114 known elements, ranging from hydrogen, whose atoms have only one electron, to the as-yet unnamed element whose atoms contain 114 electrons. Each element has its own box in the periodic table. As shown in the sample at the top of the table, that box usually contains four pieces of information: the element's name, its symbol, its atomic number, and its atomic weight. The table is divided in two directions, by rows and by columns. There are seven rows, called periods, and 18 columns, called groups or families. Two different numbering systems are used for the groups, as shown at the top of the table. The system using Roman numerals (IA, IIA, IIB, IVB, etc.) has traditionally been popular in the United States. The other system (1, 2, 3, 4, etc.) has traditionally been used in Europe and, a few years ago, was recommended for use in the United States as well. Chemical elements in the same group tend to have similar chemical properties. Those in the same row have properties that change slowly from one end of the row to the other end. Figure 2 shows how one property—atomic radius—changes for certain elements in the table. The appearance of the periodic table in Figure 1 is a little bit misleading, as is the case in almost every periodic table that is published. The reason for this misrepresentation is that two groups of elements shown at the bottom of the table actually belong within it. 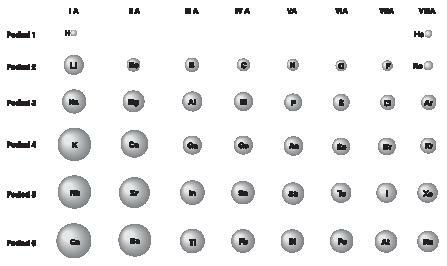 The Lanthanides, for example, belong in row 6 between lanthanum (#57) and hafnium (#72). Also, the Actinides belong in row 7 between actinium (#89) and unnilquadium (#104). The reason you don't see them there is that they simply don't fit. If they were actually inserted where they belong, the table would be much too wide to fit on a piece of paper or a wall chart. Thus, they are listed at the bottom of the table. 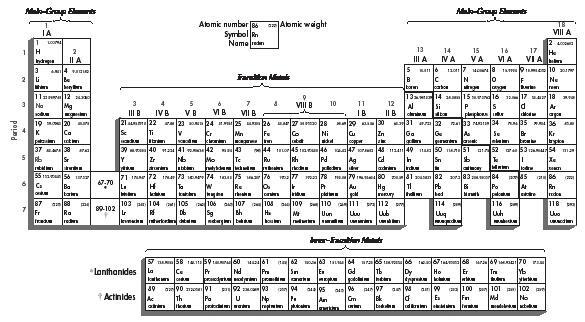 The diagonal line at the right of the table separates the elements into two major groups, the metals and nonmetals. Elements to the left of this line tend to be metals, while those to the right tend to be nonmetals. The elements that lie directly on the diagonal line are metalloids—elements that behave sometimes like metals and sometimes like nonmetals. The periodic table is one of the most powerful tools available to chemists and to chemistry students. Simply by knowing where an element is on the table, one can know a great deal about its physical and chemical properties. Recently, several man-made "superheavy" elements have been discovered. These include elements 110 and 111, both of which were made in late 1994 by an international team of scientists. Element 110 was made by colliding nickel atoms with an isotope of lead. Researchers in Russia have plans to make a different isotope of element 110 by colliding sulfur atoms with plutonium atoms. Elements 116 and 118 were recently discovered at a Berkeley, California, laboratory. Other superheavy elements that have been predicted to exist have yet to be made in the laboratory, although research continues into the creation of these elements. Many exciting discoveries remain to be uncovered concerning the creation of new elements. With the periodic table as a guide, their place is already waiting for them. this article is very informational and i shall use it for my chemistry project. of a atomic explosion. Split a atom and implode it before it explodes. While it's still in the plasma state intoduce a element by imploding it into the plasma of the split atom. The two new elements would have to be in the gas state. Implode a second element and last implode liquid nitrogen. This would be a four ring implosion device. First to split an atom to release energy. Then a second and third ring to introduce the two elements you want to merge and last liquid nitrogen to cool things down to a solid state. The by product could be energy that could be used. Would this be COLD FUSION??? I am very thankful to you for providing these simplified infomation about the periodic table, which will pay a important role in my chemistry problems. Again a bundle of Thanks. I looked you up as I am studying as a non scientist with the Rosicrucian Order AMORC. In the teachings they predict that 144 Elements must ultimately be possible. Is this plausible in your view? You say that there are spaces in the periodic table waiting for new elements to be discovered - is it known how many remain to be discovered or created? please sent me current information about chemistry. Thank u so much .l get good information about periodic classification of elements.